Nouneh Sarkissian is Armenian by birth. Her mother was a teacher and her father a journalist. Nouneh “who was brought up in a book”, has written 13 books for children, is a mother and grandmother, a supporter and author of works of arts and culture, and an artist herself. Her upbringing in a strict communist regime did little to inhibit her love of words. Visits to concerts were gifted to schools by the state so children were able to access opera, music and the theatre throughout their early education. They were brought up to appreciate Culture and to study and comprehend the importance of the written word in society. Nouneh’s love of language and her relationship with words, music and books fostered an early interest in performance and at the age of seven years old she studied music alongside school life. At eight she wrote to a local radio station requesting an audience with the producers in order to obtain a working role there. This bold approach, seeking to contribute to and be a part of a medium she loved, has stayed with her ever since. At 16, she appeared in; Pygmalion, Cinderella, Shakespeare’s Hamlet, King Lear, Romeo and Juliet and plays by Shaw and other English writers. She became a presenter for Armenian Radio for children programmes, and for television where she presented Inchooik which means WHY. Nouneh explains; “It was a programme about a little person, a puppet, who asks ‘why’ all the time. It was really intriguing and very informative for young ones. A little Google if you like, songs, musicals, puzzles and much more”. It was a very creative medium in spite of the times when censorship was part of everyday life and strict punishment was meted out for wrong doings. survived in Armenian translations. These works, with their beautiful illustrations, created by illuminators, have recently been shown in the Bodleian Library. Nouneh Sarkissian married her university sweetheart, Armen, in 1978 and moved to England in 1991. Their first son Vartan was born in 1980 and the second, Hayk, in 1984. Savannah, Nouneh’s granddaughter, is a constant creative source and inspiration to her childrens’ books. Nouneh returned to her love of music and formed a partnership with Steinway putting on concerts for aspiring and talented musicians, including a piano recital by Kit Armstrong, 23, who she has supported since the age of 15. Steinway created a limited edition of 150 pianos for its 150th anniversary. Nouneh, an amateur pianist plays regularly on one of these rosewood instruments for pleasure and for friends and family. She went on to study for a Masters in 20th Century Modern Art, her thesis being Arshile Gorky (founder of abstract expressionism in America), and, with her husband, Armen Sarkissian, the current Armenian Ambassador, (former Armenian Prime minister 1996-1997), they supported an exhibition of Gorky’s work at the Tate Modern. Nouneh was the Cultural Counsellor for the Armenian Embassy and then Chargé d’Affaires. 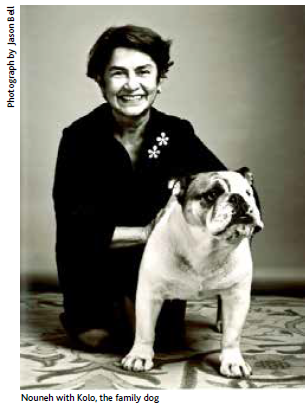 Her role with the Embassy has seen her provide a platform for many artists as well as contributing to some extraordinary and diverse exhibitions such as; Fabergé which she transferred from the Kremlin to Las Vegas, through to Symbols and Mysteries; Art in Transition in Kensington. 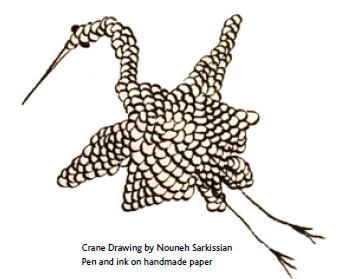 In between the worlds of Art, Culture and writing Nouneh draws and paints. Her work varies from highly vibrant, colourful paintings to stark and complex images in black ink on parchment paper. No set idea is fixed before these are drawn. It is not surprising that after a background steeped in arts, culture, study and children that her own creativity found a platform in writing. 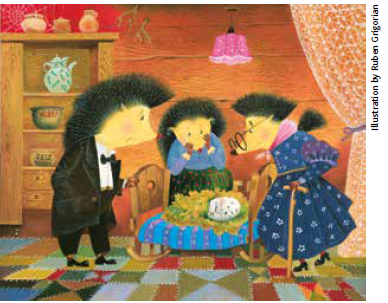 Her earlier books have been printed in several languages and are hugely popular in Armenia and Russia. They have enchanting tales and wonderful drawings in all of them. 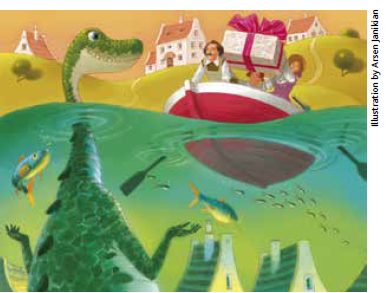 There is the Dragon Nessie, who loved her Red Shoes, but her feet were too big for them. So she cried so much that her tears flooded the village where she lived, and therefore she lived under water. One day a cobbler made red shoes just for her and her tears subsided, as did the water and people came from far and wide to see her. There is the story of the Baby Bald Hedgehog, who, yes, was born with no spikes. All the villagers and animals rallied round to help him and with their friendship and the good food they found for him, he grew some spikes. And there are The Three Dragons, one born brown, not at all a Dragon’s colour, who is teased endlessly, until he becomes the colourful one… and so on. Lessons in life and on bullying and teasing are carefully thought through with a gentle educational process here. 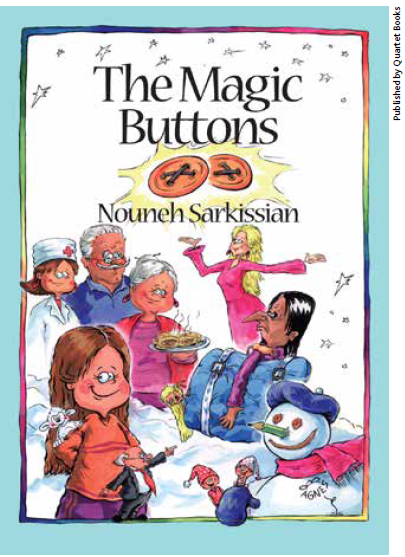 In 2015 one of Nouneh’s earlier books, The Magic Buttons, was published in the UK by Quartet Books. It is an enchanting and creative tale, packed full of the sorts of stories, mysteries and happenings that children love to hear about. The process of reading, and being read to, will find a natural home here and imaginations heightened as the text brings intrigue and vision to the reader. What more can you want; a story about people turning blue because of a Blue Magical Powder. Who IS going to find the cure? Tiny little people as your friends.Witches good and bad whose powers are robbed from them at an International witches’ and wizards’ conference. A forest packed full of more magic. Izzi Berton a villain who holds a book of all human secrets, and yes, the Magic Buttons and all that they can do. The story is suitable for 4-13 year olds, whether of reading age or reading to age. Published by Quartet Books, the ISBN numberis 9780704373839. It has black and white illustrations and is available from all good bookshops, www.amazon.co.uk and www.ebay.co.uk. priced at £12.50 Nouneh’s next book in line to be published is Prince Baziliscus. It is the story of two brothers and the Lizard World and how they save humanity from destruction. Now we could all do with learning a little bit about that……..